THE BEST IDEA I EVER HAD! In about 2002, I was thinking about hosting an appreciation dinner for the sheepherders out here on the West Desert who had gotten me through some really tough winters when they were the only customers I could count on. By 2004, I got organized enough to announce I wanted to host what I jokingly called the Old Sheepherders’ Party (because there are no young sheepherders). The party was scheduled for January for a couple of reasons. First, that is when the herds are on the desert and secondly, because we have hardly any business in the winter months and it would give us something to do. Steve Fitzgerald was one of the first that I approached about the idea. He said if I had the party that he would donate the lamb. Every year since then one of the owners has donated a lamb for the party including Brian Okelberry, Kim Aagard, Christine Lee, Baker Ranches, and Lois Sheets. Next year’s lamb will be donated by Terry Mahoney and Colleen Collers. News of a party spread fast from one sheep camp to the next on the desert. 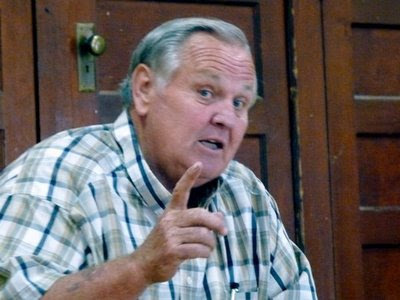 Besides word of mouth, Bruce Nielson of Producers’ Livestock Auction provided the phone numbers for some of the owners that had herds out here over the years. Most of these were people who even pre-dated me and I have lived here 34 years. Newell Johnson was one of these people. I gave him a call and we had such a nice visit and he said he would be here. Bruce had told me that Newell was in his nineties and I was a little concerned that he might not remember the call. A couple of hours later I called his daughter, Christine Lee (whom I had never met either) and told her I had talked to Newell. She reported that he had already called her with the news and that they WERE coming to the desert for the party. That first year I had no idea how many people to expect but I thought fifty or so would come. Over ninety people showed up! Besides Newell and the Lees, other attendees included some real old timers-- Morris Cook, Van Warnick, Vernon Fairchild, Jack Ingram, Wayne Jones, Morgan Larsen, Eldon Anderson and the Pharris Nielson girls--Ellen and Lois. The place was crowded but everyone had a great time visiting and telling stories and I proved to the crowd that I DO know how to cook lamb. Before the evening was over, several people came up to me and said, “You’re going to do this again next year, aren’t you?” And that’s how it became a tradition. One of Morris’ sons had the presence of mind to grab a notebook and circulated it to get names and addresses of the attendees which became the beginnings of my mailing list which now had over 250 names. By 2005, I had gotten lots of requests from people who hadn’t come the first year but wanted to come this time. I asked Dave Tilford from Ely whose ties are strong in Snake Valley to come and videotape the party. Besides visiting and dining, I added an open mike program where anybody could get up and tell a story or two. Newell yodeled and sang a couple of songs. And that became the standard format for Friday night. By this time, about 150 people were attending the party which was all the capacity we had. In 2006, Dave Tilford began recording oral histories of the old timers. 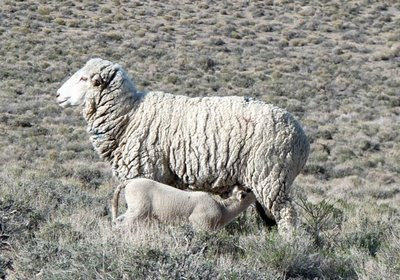 We now have a really good collection of tapes of the sheep industry in the Great Basin. The Great Basin National Heritage Area became a co-sponsor of the events and has written grants for the tapings and entertainment. We recorded Newell that year. It was the last time he yodeled. He passed away that March. At the end of that party, Morgan Larsen suggested that we revive the tradition of a Sheepherder’s Ball. 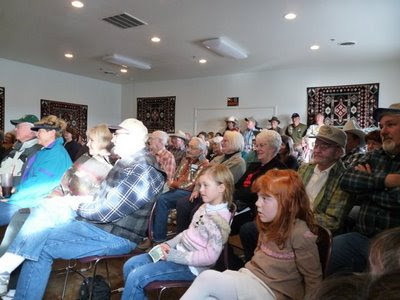 Attendance was a little smaller in 2006 because the Utah Woolgrowers’ had rescheduled their convention for the same weekend. Both Paul Freshnect, National President, and Jamie Gilmore, Utah President both called me before the party and apologized and said they would never do that again. At the end of the program on Friday night, I received the best compliment that I have ever received. 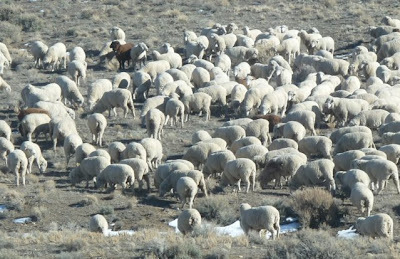 Newell got up and said it was the first time in sixty years that he had missed a Utah Woolgrowers’ Convention but he had his priorities straight and he was in the right place. To allow more people to participate, in 2007 I expanded the party to a two-day event so that those who couldn’t come on Friday could come on Saturday and vice versa. Dave Okelberry offered to cook sourdough pancakes on Saturday morning and added a Basque family style dinner followed by the Sheepherders Ball. And people appreciated the second day to have more time to visit and enjoy themselves. 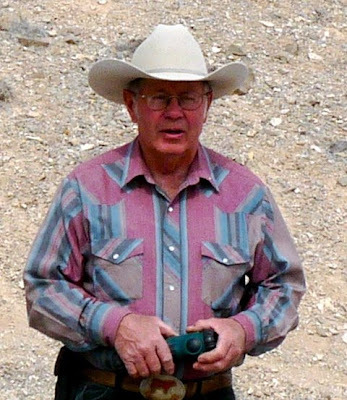 Hank Vogler from the Needs More Sheep Co. in North Spring Valley, Nevada emceed the Friday open mike party and had us shaking our heads at his hilarious but true stories. Besides noting the passing of Newell, Kim Aagard paid tribute to his dad, Welby, who had passed away just a couple of weeks before the party. After the Basque dinner, Buster Dufferena from Winnemucca, Nevada told me I could come cook in his camp anytime. the Sheepherder’s Party taught us that we could do successful special events and make a buck too. But the main building at the Border was just too small. Beginning right after the party in January, we commenced remodeling our building and added 3000 square feet which doubled our floor space. We have a new dining room and a party room with a stage for dances. The doors can open so we can use the dining room and party area for the big parties. We moved into this space in August, 2008 and everything was in place for A really BIG party. On Saturday afternoon, Sourdough Slim was in concert at the Border Inn and received the first ever standing ovation at the Border. He sang, yodeled, played his accordian and guitar. Everyone there from two year old Matthew Baker to ninety-five year old John Sims laughed and sang along and wished for the good old days. At 775-234-7300 and ask for Denys Koyle. It IS the best idea I ever had! 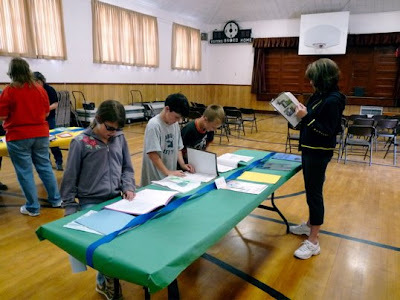 This past week, the Garrison/Baker schools held their Young Author's Fair. Each year the students write books, an invited speaker comes and does a presentation, and the students do some activities related to the presentation. Garrison School houses grades kindergarten through second with one teacher, and Baker School has third though sixth grades with one teacher. 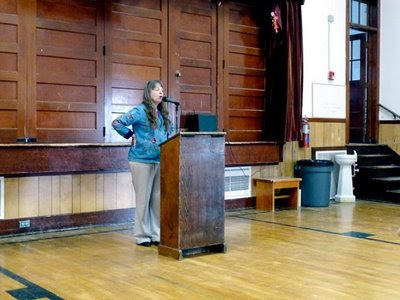 Mrs. Phillips, teacher at the Garrison school, began the program outlining the afternoon's activities. Then Denys Koyle, board member of the Great Basin National Heritage Partnership, got up and introduced the featured speaker. 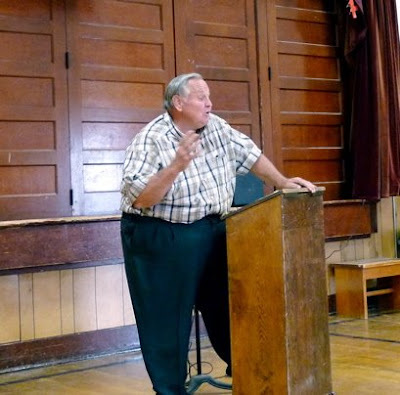 The speaker was Dr. Leo Lyman, co-author of A History of Millard County. He talked about some of the many books he has written, and then proceeded to ask the students if they could help him decide which of the many stories he knew about Snake Valley he should put in an upcoming book. He spoke about a range of stories from shootings to the establishment of a national park to people freezing to death to early pioneers. The students had fun at the end telling him which story they liked best. 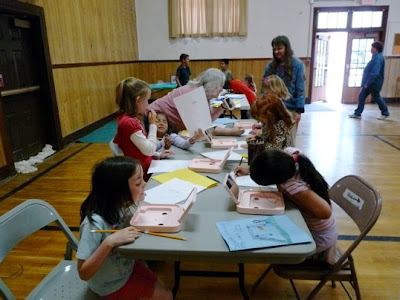 Then it was time for the students to do a self-portrait using mirrors and write a story about some event that happened in their family histories. Meanwhile their stories were on tables for others to read and leave comments. It was a fun activity and got everyone excited about writing. 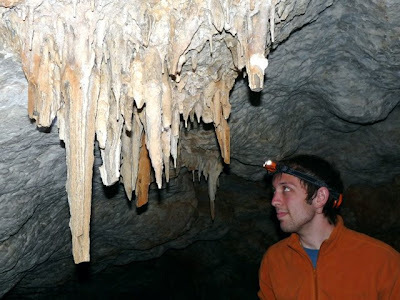 Although Snake Valley became internationally known for Lehman Cave, many other caves are also found in the area. 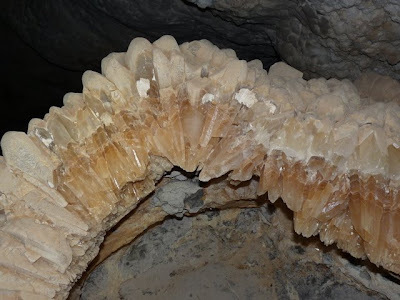 One worth visiting is Crystal Ball Cave, so named because the interior is filled with calcite crystals called nailhead spar. 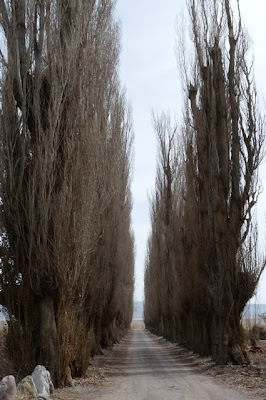 The trip starts at the end of the driveway framed by hundred-year old Lombardy poplars. 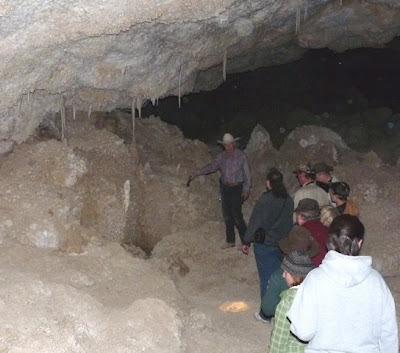 Jerald and Marlene Bates lead tours through Crystal Ball Cave, so if you want to go you need to call in advance (435-693-3145). 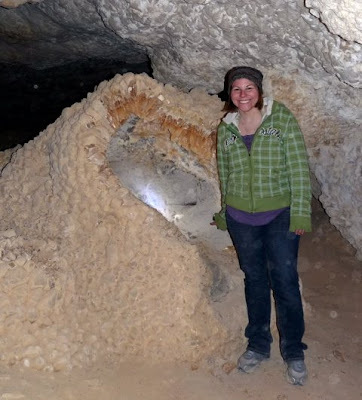 The cave is on BLM land, but they have the mining rights so manage the cave. After meeting Jerald, you follow him to the parking area for the cave and immediately realize he has a good sense of humor. He's lived out at Gandy for his entire life, and it was an uncle that found the cave in 1956. The uncle dragged young Jerald with him to help explore it. Jerald wasn't too enthusiastic due to previous unproductive trips, but this hole in the ground turned out to be different from the rest. 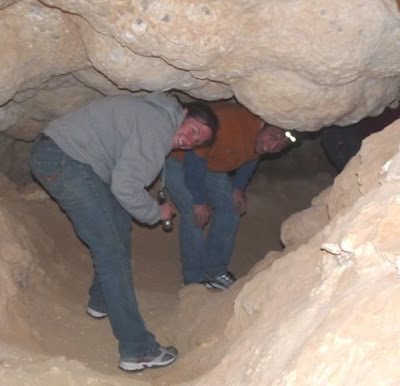 To reach the entrance of the cave requires a short hike. Jerald realizes when the group needs a break and points out plants and other things of interest. At the cave entrance, he gives more background and tells everyone not to touch cave formations. Then it's time to go in. Jerald unlocks the door, and everyone walks into the dark cave. 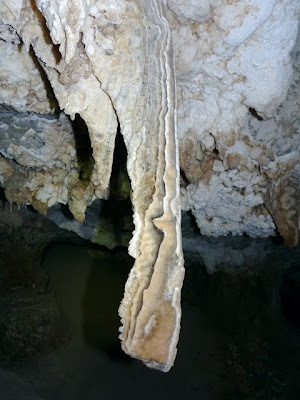 A bunch of stalactites are near the entrance. There are no lights in the cave, so everyone needs to bring one. I thought this weathered formation looked very interesting. 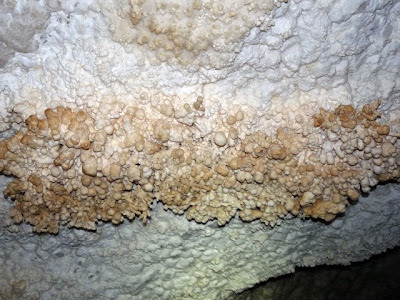 Patches of cave popcorn decorate some cave ceilings and walls. 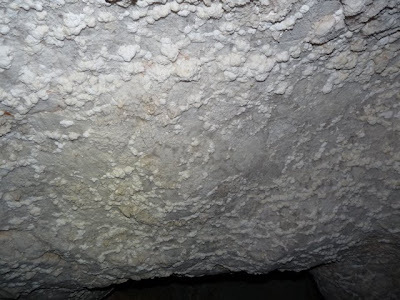 Most of the cave formations are calcite, but some gypsum is also found in the cave. 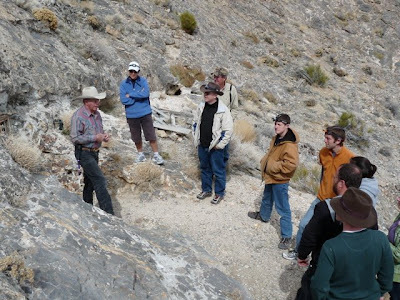 Jerald was good at explaining the different types of formations in the cave, as well as the history of it. This tall stalagmite was taller than everyone on the tour. 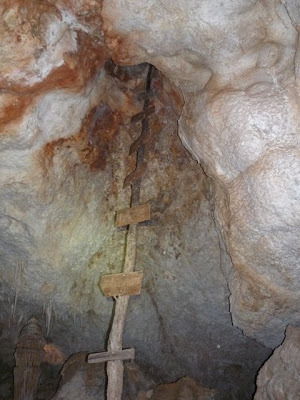 The trail goes next to this primitive ladder, leading up to an upper chamber. Jerald said he wouldn't go up it today. The tour route is on the cave floor, next to more formations. Everywhere you look there's something interesting to see. 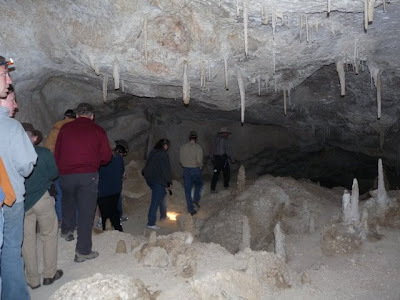 Although Crystal Ball Cave is only about 45 miles from Lehman Cave, it looks totally different. 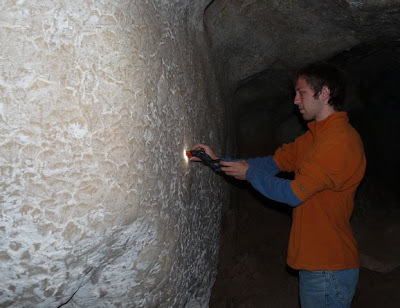 After the cave was dissolved away by carbonic acid, the cave filled several times with water supersaturated with calcium carbonate. The calcium carbonate precipitated out in a crystalline form, called nailhead spar. 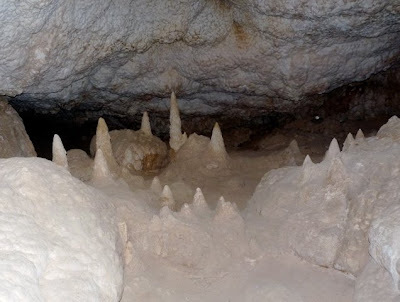 These crystals cover most of the surfaces in Crystal Ball Cave (hence the name of the cave). 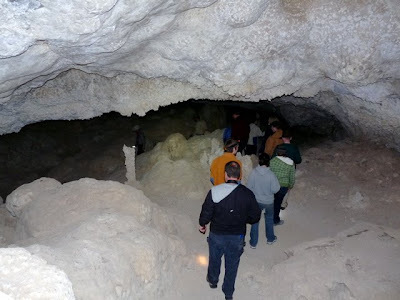 Walking into the cave is sort of like walking into a huge geode. 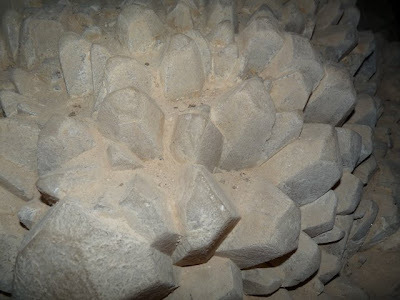 Over time, many of the crystals have been covered with sand and dirt, so they're not shiny, but they are large. Ceilings, walls, and floors all have the nailhead spar coating. Sometimes it's more translucent and glows when you put a flashlight next to it. Further into the cave are interesting formations called cave cones or raft cones. They are the remains of calcite rafts, thin layers of calcite on top of the water. 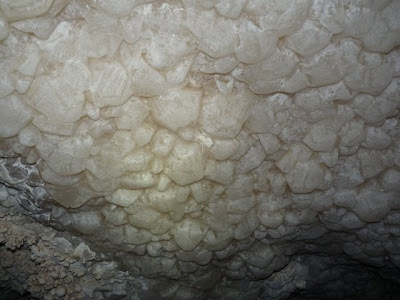 When water dripped onto the calcite rafts, the rafts broke apart and formed into these mounds. 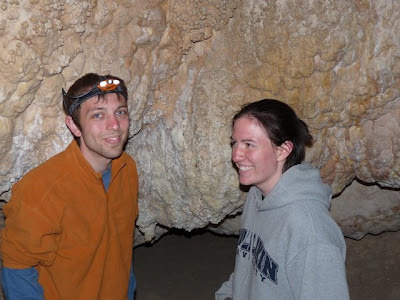 Besides the amazing cave, another appeal of the cave tour is Jerald's quick wit and funny jokes. He enjoys showing people the cave. Further into the cave the ceiling drops and requires some stoop-walking. Then the cave opens up again and you see what looks like moonmilk decorating the cave ceiling. Moonmilk looks sort of like white cheese that has oozed out of the carbonate rock. It may form due to chemical or bacterial causes. Near the exit is a very large rock that has some beautiful crystals exposed. There are a variety of colors. A close up of the crystals reveals even more beauty. 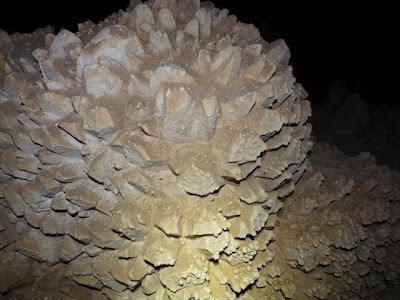 Besides the geologic wonders, Crystal Ball Cave is a treasure trove of biologic wonders. 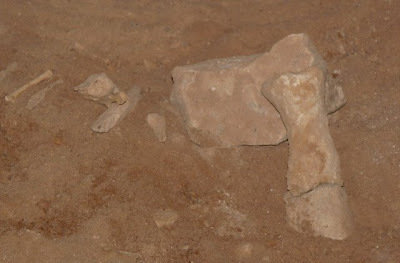 A paleontological survey of the cave revealed bones from numerous animals. Some are no longer found at this low an elevation (like bighorn sheep), while others are now extinct. These animals lived in the cave vicinity tens of thousands of years ago, when the climate was much different. 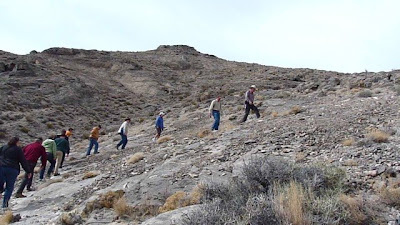 Roughly 15,000 years ago, the arm of a huge lake, Lake Bonneville, filled the bottom of the valley, and trees extended down near the lake margins. In this landscape, large-headed llamas, camels, small horses, helmeted muskox, American sabercat, and more roamed. 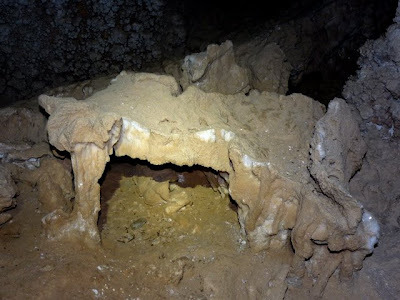 Crystal Ball Cave is the first location that a new, extinct species of skunk (Brachyprotoma brevimala) has been described. The cave tour exits from a different place than the entrance, and then it's time to walk back to the vehicles, looking out at the vastly different valley than was there not all that long ago. It would be interesting to come back in 15,000 years and see what it looks like then. 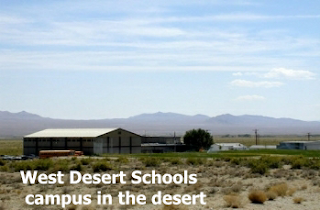 West Desert School is unique in many ways. It is the smallest high school studentbody in Utah. 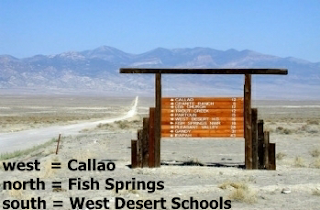 It draws students from Callao in the north, from Pleasant Valley in the west, and from south of Gandy in the south. Parents spend a good deal of time and money getting their students to school. It takes about 45 minutes to travel from Pleasant Valley (in good weather). In the past, one family sent students from Fish Springs -- an hour-long trip, twice a day! Teachers at West Desert School are unique, too. Both the high school and elementary schools are basically one-room schools. The elementary school, particularly, has one teacher, Partoun's Kathy Hill, covering grades kindergarten through six (although this year there are no 6th graders). Mrs. Hill also is the special education specialist for WDES, WDHS, and Callao. The high school is in a similar situation but has a couple of aides to help the lone teacher, Trout Creek's Ed Alder. Mr. Alder is in the classroom all day; before and after school, he fulfills principal duties as well. During one high school period, he teaches four distinct courses in the same classroom. Neither teacher has a prep period during the day. When the school goes on field trips, Mr. Alder is the bus driver (and tire-repair specialist -- speaking of which, West Desert High School may be the only school in the state where tire repair is part of the curriculum, at least unofficially). The staff similarly has extended duties. Special ed aide Kayla Christensen (from (Callao) is the librarian for both schools. Classroom aide Camille Allred (from Gandy) facilitates a high school level distance education program and is the president of the parent-teacher organization. The secretary (yours truly, from Partoun) also facilitates EdNet courses (college level distance education). Custodian April Lewis (of Partoun) also goes above and beyond the call of duty -- while we were in the midst of a staffing disruption, she volunteered many hours keeping the library in order and recently organized a junior basketball league, enlisting high school students to coach the teams. She also drives the bus, particularly for elementary field trips. Non-staff residents in the valley also help out. For example, Gandy resident Marlene Bates comes most days to continue an excellent elementary fitness program she began before she retired as school secretary. She also oversees elementary children during lunch, giving Mrs. Hill a much needed break. Mechell Alder, from Callao, volunteered to teach Spanish in the West Desert Elementary. Enrollment currently is down to the lowest levels in decades -- 6 elementary and 14 high school. 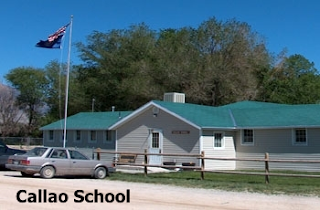 In the early 1990's the numbers were swelled by several Nevada families in Pleasant Valley, requiring the addition of two prefab elementary buildings. The campus then used four buildings, employing 9 teachers and a preschool aide. The school was a virtual hive of school and community activity. To the north, in Callao, Annette Garland holds the fort in much the same way Mrs. Hill does. During periods of peak enrollment, she has single-handedly taught grades K-8. Enrollment is down now but it still is taxing. She also serves as custodian after school and has many secretarial and administrative duties as well. Enrollment this year is down to 4. One positive aspect of small schools is the interaction between elementary students and high school students. All students share the gym after lunch and high schoolers can be seen coaching children who can barely hold a basketball. They share the lunch room, where high schoolers commonly seat themselves at the elementary table to share conversation and laughs. High school students typically help out during elementary school plays -- with backstage costume changes and stagehand duties such as scene changes and lighting. High school students have been involved in tutoring programs, helping coach elementary students in subjects such as math. The school serves as a main community center for social connectedness in the surrounding area. High school and junior league sports, when the studentbody is big enough to field teams, draws many parents and community residents. 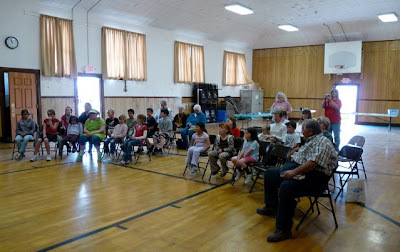 School plays and other programs, likewise have provided many memorable community moments. The school is the natural site for meetings. Two Utah governors have been honored guests at WDS -- attracting sizeable crowds. 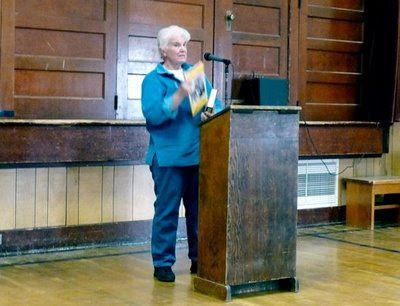 Recently, the county extension agent presented a workshop on drip irrigation. A week ago the school hosted a performance of Utah Shakespearean Festival's Twelfth Night, which several residents attended. A few meetings concerning the SNWA water grab have been hosted at WDS, including an early meeting featuring Utah Department of Natural Resources chief Mike Styler and, later, Lt. Governor Gary Herbert. Utah water rights chief, Boyd Clayton, also has visited WDS to provide updates on the UT-NV agreement negotiations. 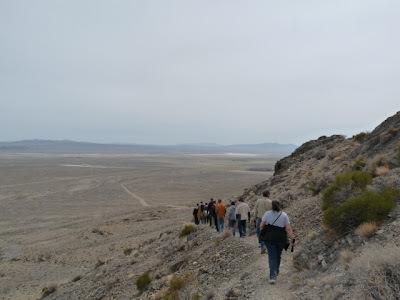 (The water grab has provided an opportunity for teachers to expand, illustrate, and emphasize critical aspects of our desert life and ecology.) The August 2005 Water Express Run, from Baker to the Federal Building in Salt Lake City, was hatched, planned, and overseen primarily by WDS staffers -- particularly Ed Alder. Through the years, WDS students have performed many public service clean-up projects. High schoolers also have been involved in local environmental conservation projects -- including a riparian restoration of a spring in the mountains above Trout Creek and a project to protect least chub south of Partoun, working with Utah DNR specialists. 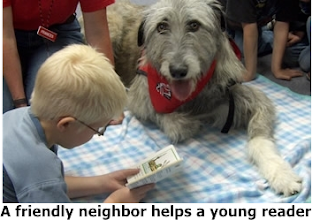 West Desert School is only one example of this kind of dedication and community cohesion. Schools in Baker, Garrison, and EskDale share similar characteristics made necessary by small studentbodies, long distances, and diverse (though small) populations. Countless school-related stories could be told about this aspect of desert life here. A lot has been happening on the water front lately, with news from the Department of Interior federal agencies that they are preparing for the hearing in September and won't stipulate and the subsequent announcement that Southern Nevada Water Authority has asked for a year delay for the hearing. I've added updates to the Snake Valley water page on ProtectSnakeValley.com. This page also has links to most of the pertinent documents that relate to water in Snake Valley. I've also restructured the water tour page. If you haven't been on a water tour, this page shows photos and information about some of the highlights. It's also a good reminder if you have been on a water tour, because sometimes by the end of the day, it can be confusing to remember all the sites!